For those looking to stay at ArcTanGent for the full experience the festival offers camping options including the ever elegant glamping. Don't worry about going hungry as the festival boasts having some of the best food catering for vegetarians, vegans & gluten free. Now that you're ready to rock it's time to plan your travel! 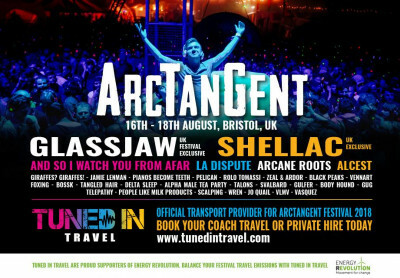 Tuned in Travel are proud to announce being the official transport partners for ArcTanGent, taking the hassle out of travel for you. We have weekend return coach options from: Manchester, Birmingham, Glasgow, Edinbrugh, Cardiff & Newport. This is a great option for those travelling solo or in small groups. For those travelling in larger group of twelve to fifty people who are seeking something a little more exclusive we offer private high vehicles, chauffeuring you and your group in comfort and style. If you can’t find a trip that suits your group or if you have any accessibility requirements, simply contact our friendly customer service team on: customerservice@tunedintravel.com for a free quotation.